Unlike dogs, cats domesticated themselves to be part of our lives. There are many feline species around the world that have adapted to changes. Ancient carvings show that even the Egyptians worshipped them. They were treated as royalty and given all the luxuries available at the time. Even today, they are living a royal life. While you are familiar with many feline species such as lions, tigers, cougars, leopards and even jaguars, there are lots of varieties that you have probably never heard of. Most of them are as beautiful as they are rare. 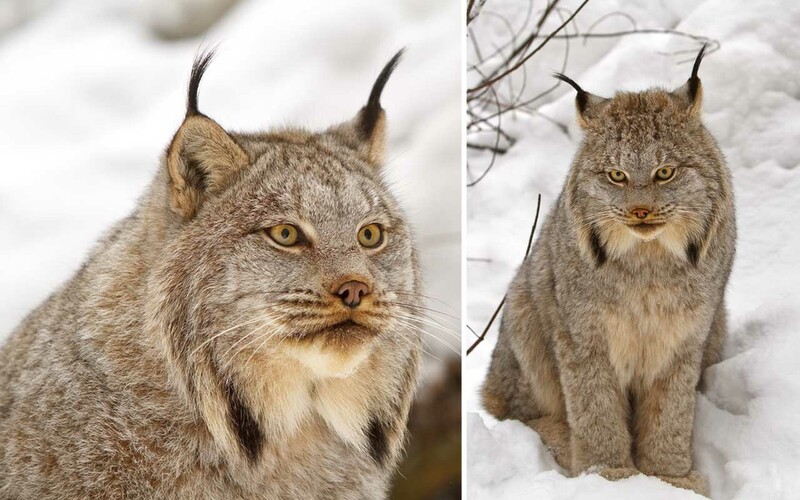 The Canadian Lynx or Lynx Canadensis is a member of the cat family and a relative of the Eurasian Lynx. It mainly inhabits parts of the United States including Alaska, as well as Canada. They have thick fur and large paws that allows them to survive harsh winters. The feline’s pointy ears makes them extremely easily recognizable. However, urbanization and deforestation has caused its population to steadily decline, adding them to the list of endangered species in both United States and Canada. 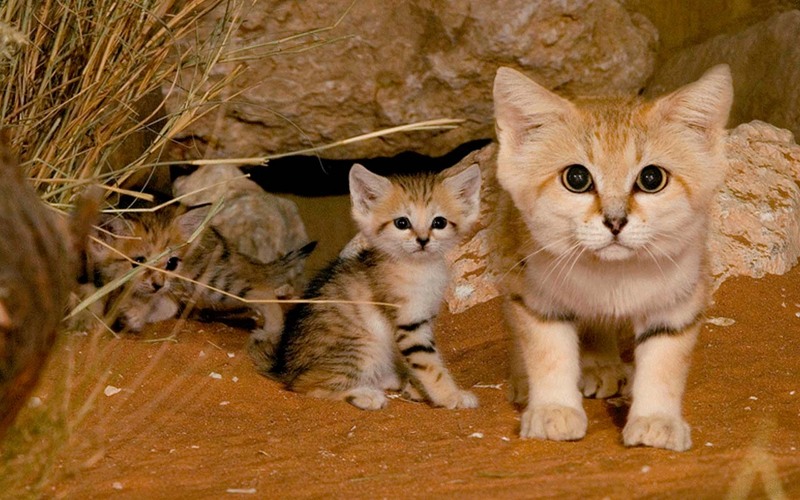 Sand cats retain a kitten-like appearance their whole lives, giving the impression that they never grow up. 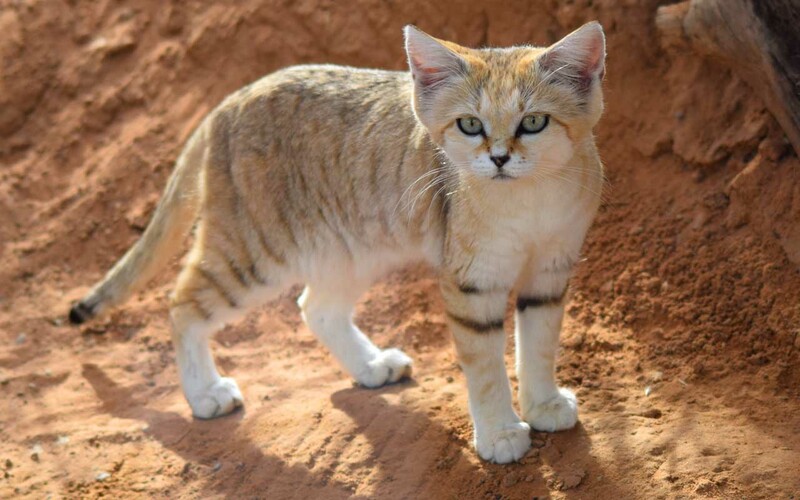 The feline is native to desert areas in North Africa, Arabia, Central Asia, and Pakistan. When compared to their offspring, they seem as if they don’t age at all; giving them the appearance of lifelong kittens. Their oversized ears is what makes them appear young but they actually play an important role in its life. Since sound does not travel far in sand-covered terrain, the desert-dwellers’ large ears help them detect prey both above and below. Sadly, the species is currently “threatened”, but there are many organizations that are dedicated to help save them. 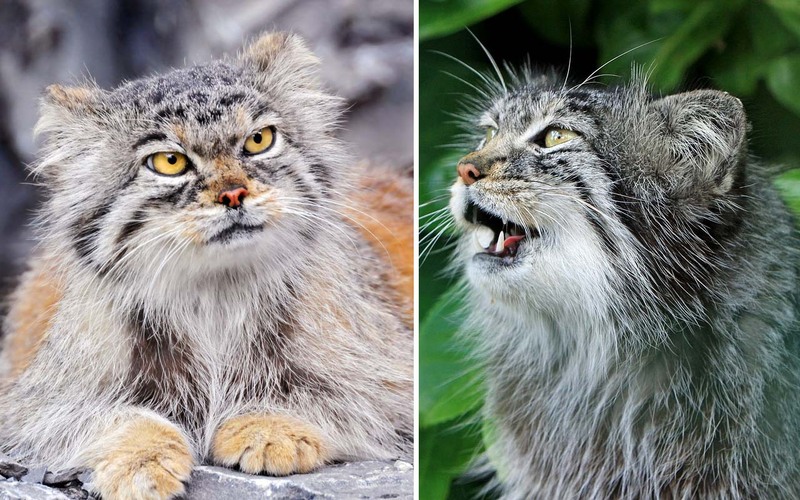 The Pallas cat is a small wildcat known for its unusual and adorable look. Although they appear to be large, it’s all an illusion created by their fluffy fur. Their dense coats give them a bigger and heavier look but in reality, they are about the size of domestic cats. Unlike other cats, the Pallas cats have unusual pupils. Instead of vertical slits like other felines, the Pallas has small circles. They are mainly found throughout central Asia, from western Iran to western China. Although they look like a close relative of the lynx, the Caracal is a species of medium sized wild cat. 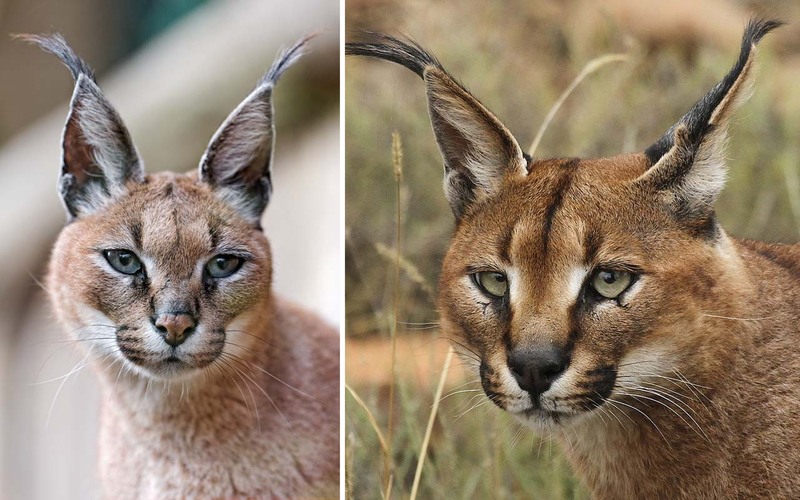 Found in Africa, southwestern parts of Asia and Middle East, the Caracal inhabits dry and arid regions, woodlands, scrublands, savannas, evergreens and mountain forests. They are covered with shirt fur and have elongated ears that provide them with an excellent sense of hearing. The Caracal is a nocturnal animal but is also known to hunt during the day. Although they look small, they can be extremely fast, capable of reaching speeds of up to 50 mph. 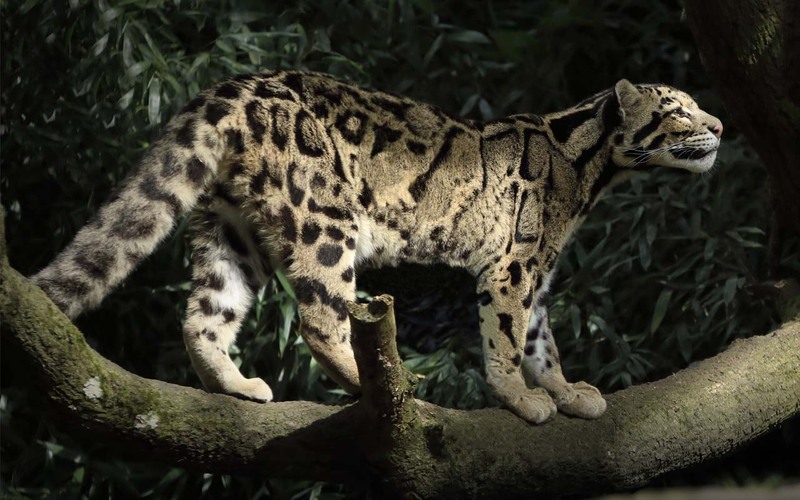 The clouded leopard is named after its spotted coat. Mainly found in parts of Asia, the clouded leopard is seldom seen in the wild, so most of their habitat remains a mystery. They are extremely good climbers who are capable of hanging down from branches to catch prey. Although they have short legs, they are extremely powerful and are also equipped with rotating rear ankles like squirrels. This allows them to climb down a tree, head first. Like most felines, they are solitary animals. The Serval is one of the lesser known cats of Africa, since they are seldom seem in the wild. The spotted feline is mostly found in the savannah’s long-grass environments but they are known to occupy a variety of habitats; all associated with water sources. Servals are solitary animals and each feline maintains its own territory. Their elongated ears allow them to hear small mammals moving through the grass or underground. The snow leopard is a descendant of the wild cat and panther families and is native to the rugged and snowy highlands of Central Asia. 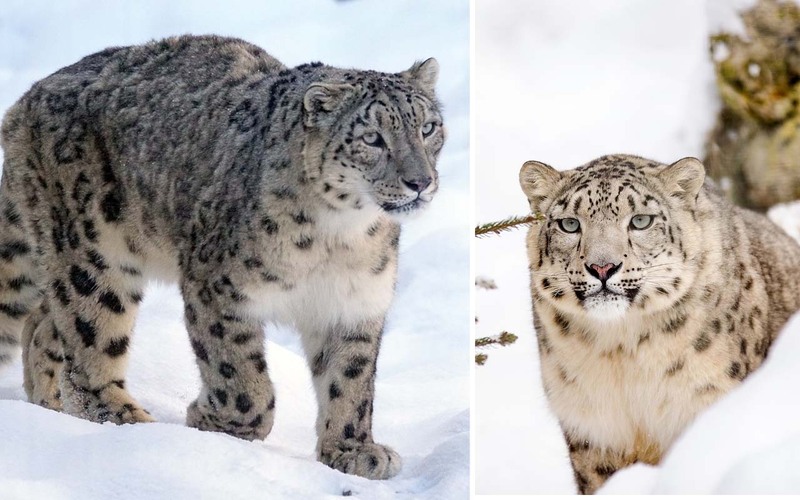 60% of the snow leopard population is found in China and the rest is spread over Central and South Asia in countries like Pakistan, Nepal, Afghanistan, India, Mongolia, Uzbekistan, Tajikistan, Bhutan, Russia and Kazakhstan. The felines prefer to live in ridges, cliffs and rock outcrops since they are capable of camouflaging themselves better in those environments. While they are mainly found 3500 meters above sea level, during summer, they climb to cooler altitudes of as high as 5000 meters. 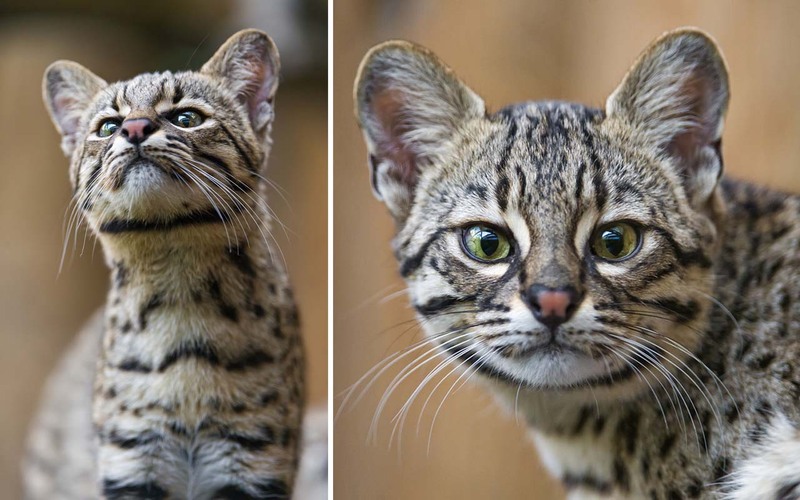 Geoffroy’s cat is a wild cat, native to southern and central South America. Although they are relatively common in many areas, they are considered to be “near threatened” by IUCN. 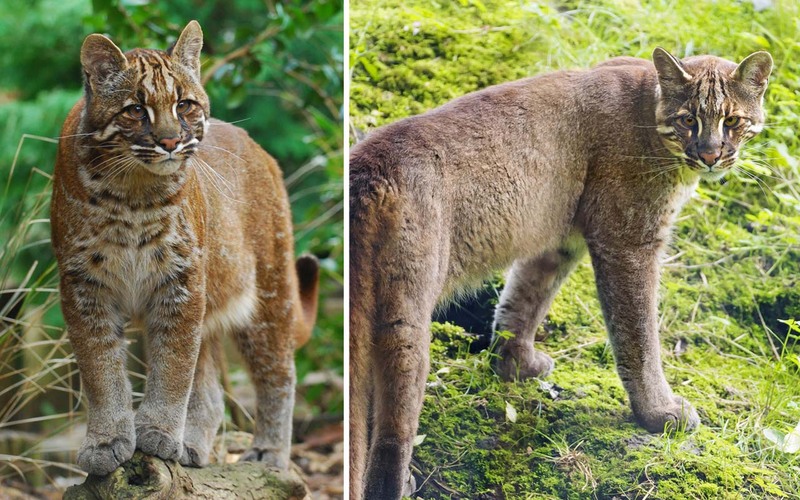 The feline resides mainly in the Andes, Pampas and Gran Chaco landscape but are also found from southern Bolivia to the Straits of Magellan, at heights from sea level to 3,300 meters (10,800 ft). The Asian golden cat is a medium-sized wild cat that is mainly found in Southeastern Asia at altitudes of up to 9,800 feet. They are extremely shy and are mostly active during the dawn. The felines travel around 6 miles every day in search of food and are highly territorial; with each feline’s territory ranging to somewhere around 18 miles. Recently, they have been added to the list of endangered species due to deforestation and urbanization. 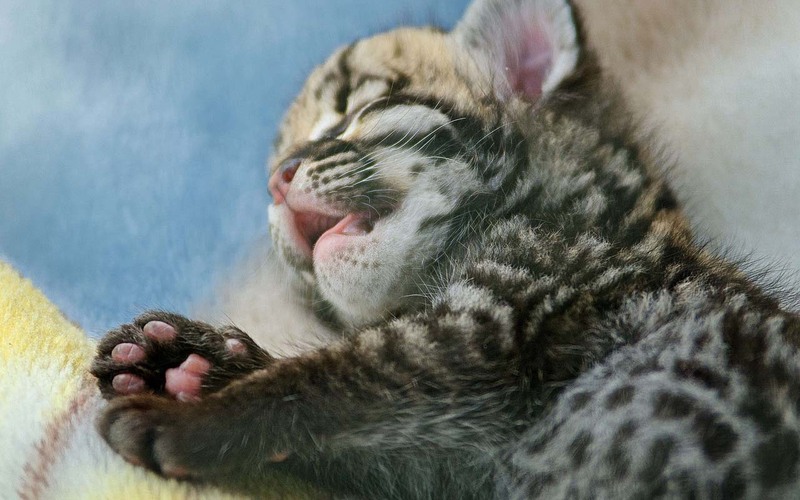 Ocelots are medium-sized cats, mainly found in Central and South America and in Texas. Today, they are endangered species and are protected under the law. Ocelots are twice the size of house cats and are known for their excellent eyesight and sense of hearing, both of which helps them detect prey. They are nocturnal animals, which means that they hunt during the night and rest during the day. 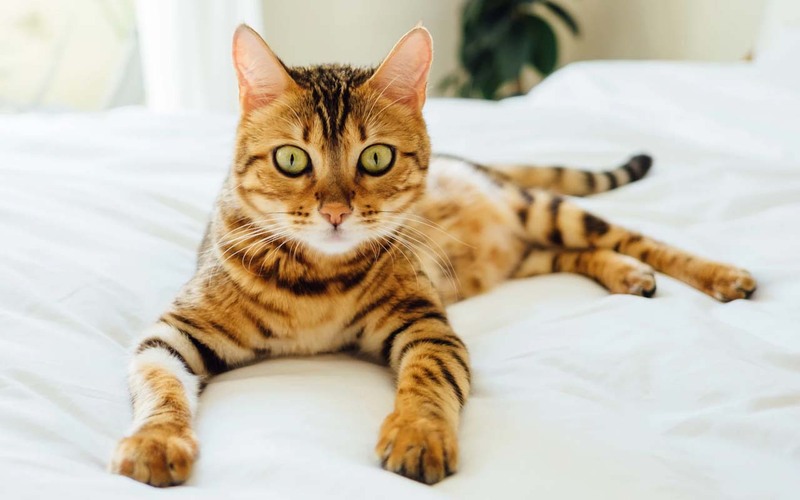 The Bengal cat looks extremely similar to a leopard and is also known as the Asian leopard cat. Mainly found in South and East Asia, they are a popular breed of feline in the US. 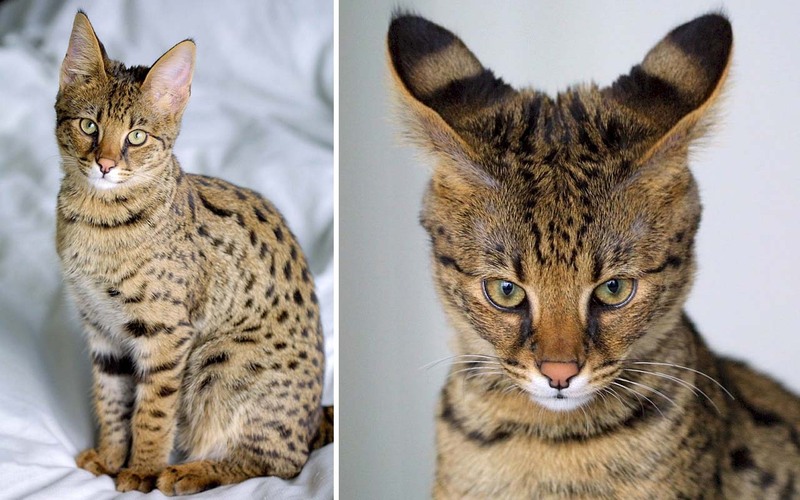 Their distinctively patterned fur is unique and no two cats have the same patterns on their bodies. Although there are a variety of shades, the most popular Bengal colors are brown/black.